Not only does BBP have a huge selection of flavors, the quality they provide is the best around. Their milkshakes are thick, creamy and aren’t too sweet. Their menu is extensive, featuring flavors like vanilla, dark chocolate, black and white, strawberry, mocha, pistachio, blueberry-pomegranate, coconut, mint chocolate chip and coffee. If you’re looking to get tipsy, BBP has you covered. They have spiked milkshakes so you can combine your dessert and pre-game in one handy cup. Check out their boozy selection of flavors like vanilla caramel bourbon, pineapple coconut rum and mocha kahlua vodka. Who knew vegan milkshakes could taste so good? Made with soy ice cream, these milkshakes have a really unique but awesome taste. Their newest seasonal flavor is apple pie (HELLO FALL) and it’s made with real apple cider. It is truly the perfect embodiment of a necessary fall comfort food. Hip City also offers chocolate, vanilla and creamsicle, incase apple pie isn’t your thing. These two spots have pretty solid milkshakes and I would rate them around the same (they have the same owner so that makes sense). They offer the classics, like chocolate and vanilla, but also spice it up with cookies and cream and strawberry. Since both these spots offer fries, you should probably get a side of them and dip them in your milkshake. Just saying. Axis has milkshake options that are pretty standard, but they get points for being open 24/7. When that late night/early morning milkshake craving hits, you know who to call. I was skeptical about the strawberry at first, but a particularly insightful friend forced me to try it and it’s now my favorite. 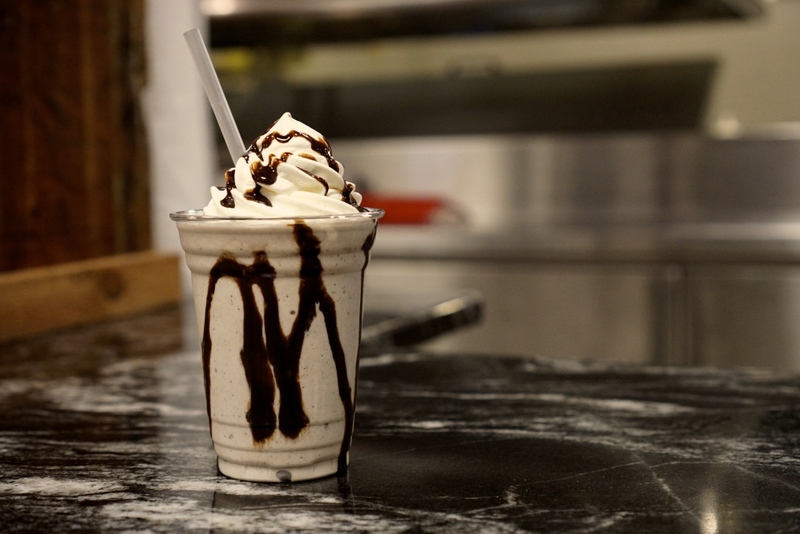 Although a little bit of a walk, Shake Shack’s interesting flavored shakes are worth the trek. They have caramel, peanut butter, strawberry, coffee (aka the fair shake), black and white, chocolate and vanilla. The black and white shake was decent, but didn’t live up to my expectations. If you’re a coffee lover, I would recommend the fair shake and if you’re not, the root beer float is also on point.